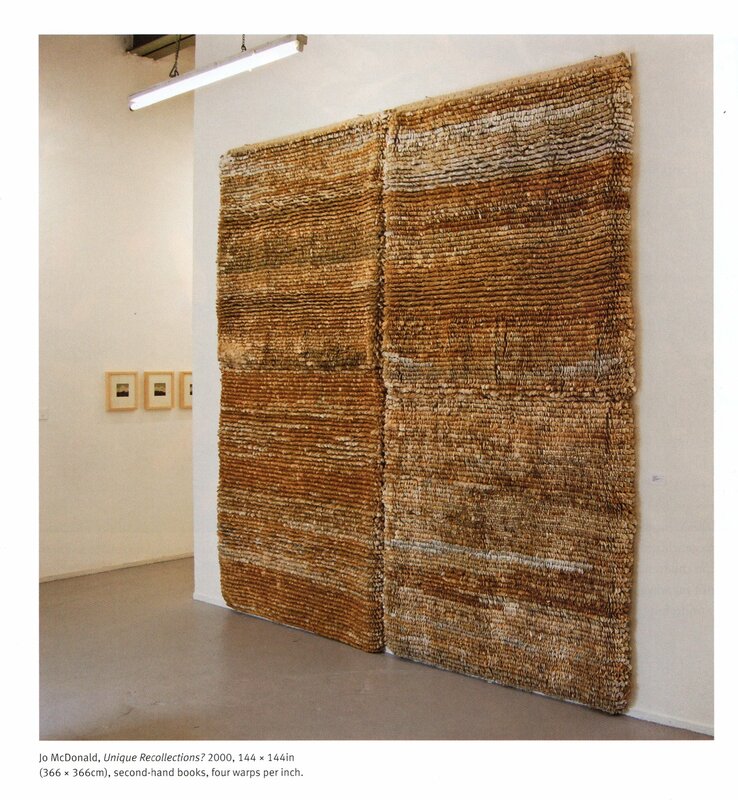 When I did my review of Tapestry Weaving: Design and Technique by Joanne Soroka I mentioned how much I liked the work by Jo McDonald who used second hand books to make a design using Giordes knots as per the photo below. I commented in that post that this was a technique I wanted to try but was thinking of doing a version in colour to form a landscape. I decided that I wanted to pursue this idea and had a frame made in Jarrah wood approx 86cm x 23cm with eye screws attached at 1cm intervals inside each short end. I used warping cotton to create the warp and, as commented in my Stage 4 sample, as I knew that the warp thread would show a lot on the surface I painted this in the rough colours that I wanted. Then I cut 1 cm wide strips from magazine pages, selecting the appropriate colours for sea, sand, ranges and sky. I wove these onto my warp using the strips as they were for Soumak weaving, cutting into bundles of 5 strips 8 cm long for Giordes knots and folding strips in half lengthwise for plain weave. I tried to create the effect of waves in the sea with the use of Soumak weaving and Giordes knots to represent the surf. The division between sea and sand is not well defined, this was a deliberate choice of similar values of colour to show where the sea comes in and recedes with the tide. For the sand area I added some darker sections for driftwood and pebbles, adding some surface weaving to represent a pile of driftwood. The range section represents the Cape Range near Exmouth with flashes of red for the rich deep red of the Pindan soil. I changed this section from horizontal to shaped weaving to create a hilly effect and used a lot more of the knots and Soumak to make it more 3 dimensional. The sky returned to mostly plain weave, with some white Soumak at angles to create clouds. I am pleased with this experiment as it achieved what I wanted in creating a landscape from magazine pages. It could be improved by deepening the sea area in the foreground and making the sand area a bit shorter. It was very time consuming, selecting the colours, making the weave and tidying up all the ends at the back which are glued down into place.